UDM Downloads > 3D Magic Mahjongg - 4th of July! 3D Magic Mahjongg "4th of July" is a Yankee Doodle Dandy. Clear the board by removing the 144 tiles in matching pairs. Based on the well-known Chinese tile game, 3D Magic Mahjongg "4th of July" features tiles resplendent with American patriotic icons and symbols including Uncle Sam's hat, the American Eagle, firecrackers, and Old Glory. Full versions of John Philip Sousa's Stars and Stripes Forever, Washington Post March, and other patriotic hymns are included to please the ears. This is a game Norman Rockwell would have loved. Features: - The unique game analysis feature has two advisory levels that determine if the player has made a move that could jeopardize the successful conclusion of the game. Players may undo moves and choose an alternate path. - Game statistics for each board layout give the player information about the number games played/won, number of undos used, average time etc. - Highscore tables to list the best times - Camera panel lets you adjust the view to see the board from any angle. - Easy and intuitive interface. - Several tile sets and layouts Supremely easy to learn but hard to stop playing! 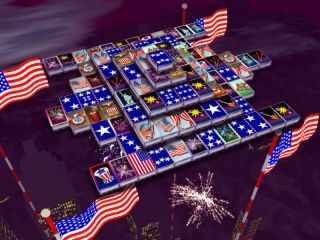 For anyone who has ever played a variation of Mahjongg and liked it, you'll love 3D Magic Mahjongg "4th of July"! Non-violent and fun for all ages.